JTA produces breaking news and analysis on issues of interest and concern to the Jewish world. Based in New York, the non-profit organization’s reporting covers the Jewish world nationally and internationally. Content feeds into several websites and JTA is also a news service for more than one hundred Jewish publications and websites worldwide. Targum Shlishi has supported JTA in multiple years. Targum Shlishi has supported the Chabad Jewish Community Center’s new building campaign during multiple years. The JCC is dedicated to providing an open-door environment for every Jew, regardless of background, philosophy, or level of commitment, and to strengthening and enhancing Jewish family life. 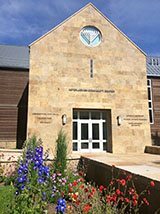 Led by Rabbi Mendel Mintz, the Center serves individuals and families looking for a non-judgmental, accepting, personalized Jewish experience. The Shul of Bal Harbour is an innovative synagogue with a varied membership, ranging from experienced congregants to Jews just returning to or learning about their roots, to an active Sephardic component. Targum Shlishi has supported several projects at The Shul in recent years.